Sexists ads from the 1950's. We've come a long way!. Wallpaper and background images in the Feminism club tagged: advertising misogyny women 1950's. We've come a long way! This Feminism photo contains 애니메이션, 만화, and 만화책. There might also be 신문 용지, 잡지, 타블로이드, 걸레, 신문, 종이, 타블로 이드, and 걸 레. It's hard to believe, but these are actual ads from the '50's. It seems almost surreal. 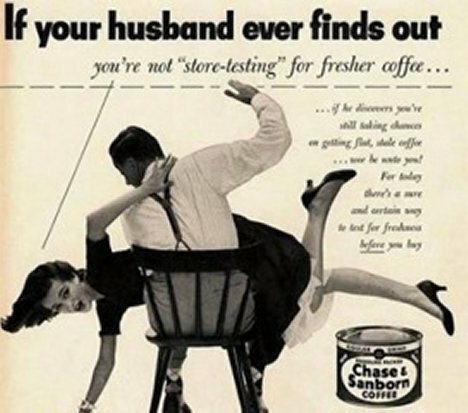 In REALITY a abusive husband would.beat.his wife over a thing like fresh coffee. The add is trying to PREVENT domestic violence.